On November 17, 2014, we started a very unique experiment. The goal of the experiment is simple: "Can We Make 40% Per Year With Trading - SAFELY and CONSISTENTLY?" 50% per month is quite aggressive. After all, this would beat most professional hedge fund managers! And as if THIS goal is not challenging enough, we added some more "restrictions" to this experiment - making it almost impossible to succeed! The trading strategy should be easy to understandand easy to use. Even somebody who has NEVER traded before should be able to understand and execute the trading strategyin less than 60 minutes. The trading strategyshould work equally well on a $2,000 anda $200,000 account. It's important to usthat ANYBODY could trade this strategy. You should be able to trade the strategy WITHOUT buying any charting software, indicators, etc. It should be possible to trade this strategy with a simple browser, no matter whether you are on a PC, Mac, tablet or even your phone! It should be possibleto trade the strategy evenif you have a full-time job. Therefore it should take less than 5 minutes per day to place the trades andalso manage the positions. Pretty challenging, isn't it? - But we did it! And thus far the results have been GREAT! After spending months testing and trading the strategy on a live account, we narrowed it down to the BEST 6 markets to trade. And on November 17th, 2014 we started to trade THESE markets on a live account - and we have been going strong ever since! So let me show you the strategy that we use for our experiment. We tried different strategies for stocks, options, futures and even forex markets. But the market that produced the BEST results is BINARY OPTIONS. If you never heard of Binary Options, let me briefly explain what they are. Binary Options are traded at the North American Derivatives Exchange (NADEX). You can even trade CURRENCIES with Binary Options (e.g. Euro, Yen, British Pound, etc)! In short: You can basically trade ANY market with Binary Options. They expire DAILY, so you never have to carry (and worry about) a position overnight! In order to place the trade, you BUY or SELL the option for a pre-determined price between $1 and $99. The price depends on the probability that the option will make money at the end of the day. Let's say the pre-determined price for an option that the S&P500 closes above 2,100 today is $35. If you are right and the S&P500 closes above 2,100 you will get $100. If you are wrong, you lose the money you paid for the option, and you lose $35. So if you are right, you are making $65 based on the $35 that you risked. We have been running a sophisticated algorithm on 5 years of data for 6 different markets, and based on this algorithm we know the probability of a market closing above or below a certain price. Take a look! The table below is an example of the trades we want to place, including the probabilities of the trade. We update these values every night, and the next morning you just have to wait until a market goes above or below the "trigger price”, and then you place an order. 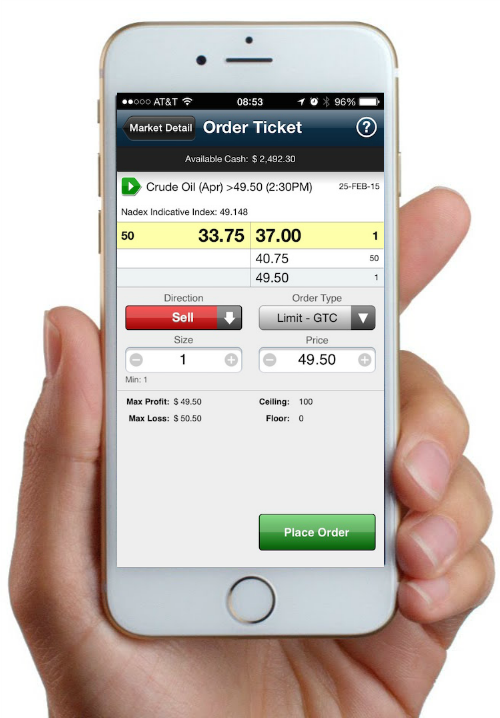 In order to place an order, simply log into our your trading account using a simple web browser, and that's it. Now you just need to log into your account and place the order as specified. It's that easy! We KNOW the probabilities based on the past 5 years! In the REAL LIFE statistics above you can see exactly what OUR winning percentage is. And we're updating the statistic daily, so that you can follow our experiment. Keep in mind that we are just trading a small $2,000 account, so if you have more money in your account, you would just trade more contracts! The trading strategy should be easy to understand and easy to use. Even somebody who has NEVER traded before should be able to understand and execute the trading strategyin less than 60 minutes. I just briefly explained it to you in a few minutes, so I'm sure you'll fully understand it after 60 minutes – CHECK! You should be able to trade the strategy WITHOUT buying any charting software, indicators, etc. It should be possible to trade this strategy with a simple browser, no matter whether you are on a PC, Mac, tablet or even your phone! All you need is the table with the probabilities and exact entry signals and you can start trading the strategy right away! When trading binary options you only need a browser - CHECK! It should be possible to trade the strategy even if you have a full-time job. Therefore it shouldn't take longer than 5 minutes per day to place the trades and manage the positions. You have seen how easy and fast it is to place the orders. And once the order is in the market, there's nothing elseyou need to do. Just wait until the end of the day to see if you are right or wrong. If you are right, the money will be automatically deposited into your account! - CHECK! So what do you think? - Easy enough, isn't it? Look, I have been trading for more than 25 years. I don't know about ANY other way that makes it so easy to identify and place the trades, especially not with the accuracy that we're achieving! I wish Binary Options existed when I started trading! I’m sure I would have achieved my trading goals MUCH QUICKER! We decided to make our table with the probabilities available for a limited amount of traders. As you know, "stock picking services" or other newsletters charge $200 and more per month! But the reason we started this experiment and created this strategy in the first place is because I wanted a solution for EVERYBODY who wants to trade - regardless of experience or account size - and I want YOU to have access to this, too. We are planning to increase the price of this service to$197 per month, but when you join us TODAY, you can join for only $47 ($197) per month. And of course you can cancel anytime, if you don’t want to continue for ANY reason. Just click on the SIGN UP NOW button below to join. You will then receive an email with a username and a password that allows you to access the members area in which you will see the table with detailed trading instructions. We will update the table the night before the next trading day, and we will send you an email as soon as it is updated, so that you don't miss any trades. You will also have access to our training videos, in which we explain EXACTLY how to trade this strategy. 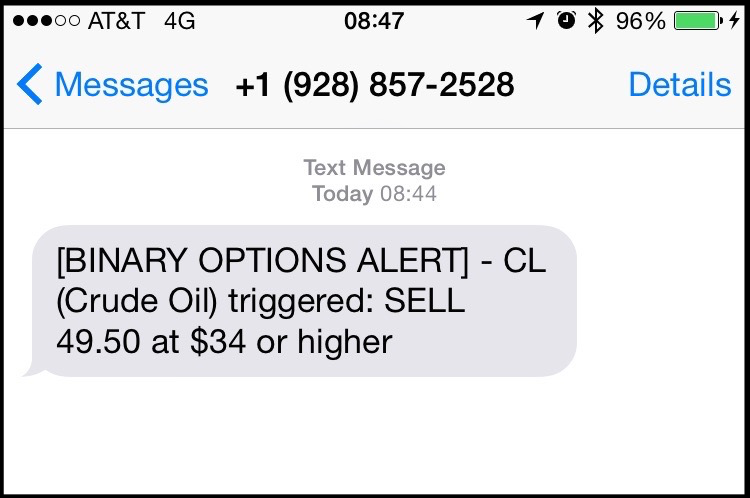 If you decide to join us TODAY, we will upgrade you to our TEXT ALERT SERVICE free of charge! Whenever a trade occurs, we are sending you a text message. So you don't have to sit in front of your computer all day. You can simply go about your day as usual, and whenever you receive a text message, you log into your account using a browser - or even your phone - and place the trade. It's that easy! Look, you've wasted enough time, energy and money trying to make consistent returns with trading! As you can see from the LIVE results above, THIS works! You are no longer GUESSING, you now trade with the odds in your favor. Even if you just want to follow it on a demo account first, sign up now and let's get you started today! Just click the "Sign Up Now" button below and place your order on our secure server. You will get instant access to the Binary Options Probabilities Table and all the training videos so that you can start trading this strategy right away.